Time for this nonsense to finally come to a resounding end. There is a sickness running through the world, a sickness that attempts to twist every instance of narrative fiction through the siphon of errors that is the “Hero’s Journey” story structure paradigm. Made popular in the 90s through the work of Christopher Vogler, this understanding of story makes the claim that every great story can be traced back to the monomyth as uncovered by Joseph Campbell. From error-ridden snarky videos to lightweight analysis of plot elements, the Internet teems with those who think every story is the same and that this similarity can be attributed to man’s need for mythic transformation. There can be nothing more destructive to the world of storytelling than this compulsion for spiritual metamorphosis. Stories are about solving problems. Sometimes, solving those problems require the centerpiece of a story, the Main Character, to undergo a major transformation in how they see the world. Sometimes they don’t. There is nothing inherently better about a story where the Main Character transforms. See Chinatown and/or Amadeus for more on this. Besides the aforementioned spiritual implications, the Hero’s Journey fails because it is so general. How could an understanding of story be considered accurate or helpful when it considers Luke Skywalker and Neo the same “Hero”. In superficial general terms, yes, the two share similar aspects, but under closer examination it becomes clear that there are significant and important differences in the problems and issues facing Luke and Neo. When it comes to constructing a story, the specifics of the Hero’s Journey are open to interpretation. This is not a plus. This does not make the Hero’s Journey more human. Instead, it simply adds confusion and noise to many an Author’s intuition. For proof of this, one doesn’t need much more than a simple observation of the mental gymnastics that abound when a classic story doesn’t quite fit into the paradigm. When the Protagonist doesn’t change, the claim is made that there are actually two Hero’s Journeys going on. What about stories where the Hero Crosses the Threshold before they’ve even met the Mentor? No problem, because order has no meaning in this paradigm. A writer can do whatever they want as long as they hit the required points. For a paradigm to be accurate, there should be no need to warp it or bend it to fit stories that are obviously successful. The individual, through prolonged psychological disciplines, gives up completely all attachment to his personal limitations, idiosyncrasies, hopes and fears, no longer resists the self-annihilation that is prerequisite to rebirth in the realization of truth, and so becomes ripe, at last, for the great at-one-ment. His personal ambitions being totally dissolved, he no longer tries to live but willingly relaxes to whatever may come to pass in him; he becomes, that is to say, an anonymity. The Hero loses himself and is reborn. This is exactly what happens to Clarice Starling in The Silence of the Lambs and Jake Gittes in Chinatown. Wait. No it isn’t. This complete transformation of self is a key component of the Hero’s Journey. To leave it out, as is done in this interpretation of Star Trek as Hero’s Journey, is to ignore the true meaning behind the Hero’s becoming a Master of Two Worlds. Fans of the Hero’s Journey paradigm cherry pick which precepts of the monomyth fit well with thier argument. They use what they need and leave out what doesn’t work. Furthering this cafeteria-style approach to story structure (in addition to employing the ridiculous notion of the MacGuffin), the article defends its interpretation by adding that Spock underwent a Hero’s Journey as well. This is the same mistake Stuart Voytilla made in his book Myth and the Movies and his analysis of Disney’s Beauty and the Beast. The idea that there are two instances of a Hero’s Journey in one story is a clear indicator that there is a misunderstanding over the relationship located at the heart of every complete story. In every complete story there is a Main Character and an Impact Character. The Main Character comes to a story with some emotional baggage. The Impact Character enters and by virtue of her presence, brings the Main Character’s baggage to the surface. She “impacts” him. One way or another, the two argue over the proper way to solve the problems in the story until at the end the Main Character has to come to a decision: Either keep doing things the way he always has, or change and adopt the Impact Character’s way of seeing things. This exists in every great story because it is the way an Author proves an argument. Once the Main Character makes that choice the story will either end in success or failure. This is the Author saying, See, make this change and great things will happen or See, make this change and tragedy will befall you. Stories are about solving problems, not mythical journeys of spiritual transcendence. In Disney’s Beauty and the Beast Belle is the Main Character and the Beast is the Impact Character. Both don’t fit in with the rest of society, but one—Belle—has found an appropriate way of dealing with it. In the end, she continues to do things the way she always has. The Beast, however, is the one who has the major transformational change. This is NOT the physical transformation but rather, the transformation of character that he undergoes. He changes and the spell is broken. The Author’s proof that Belle made the right choice is apparent in the smile on her face as they dance into the clouds. No need for two heroic journeys. No need for mental warping. Same thing happens in Star Trek (though instead of purple clouds we get shiny lens flares!). Kirk is the Main Character and Spock is the Impact Character. Both come to the story with different approaches towards dealing with the Nero problem, two different approaches that clash when they come into contact with each other. Kirk is all about the relentless pursuit of the goal while Spock prefers to take a more reserved “logical” approach. Throughout the story, they argue over the proper approach until finally Spock relinquishes control and finds a way to allow a little freedom into his life, both in the world around him, and more importantly, inside of him emotionally. Spock has undergone the major transformation of character. Kirk is still driven by that need to pursue, to win no matter what it takes. He has not lost a portion of himself on his way towards becoming a Master of Two Worlds. He starts as an arrogant sonovabitch, and becomes a slightly more motivated arrogant sonovabitch. He does not learn to sacrifice, he does not learn to work well with others—he takes over the goddam ship. He’s right all the time, he never doubts he’s right, and the only obstacle he occasionally faces is when other people aren’t sharp enough to see how frikkin’ awesome—and right—he is as quickly as they should. Beautifully written and 100% accurate. Rogers uses the term revelatory arc to describe Kirk’s lack of change, but what would be even more precise would be to refer to him as the Steadfast Main Character. Every Main Character has his or her own resolve brought into question. Some change, others remain steadfast. It really is that simple. A simple, but powerful tool available to any writer who wants to create something with meaning. 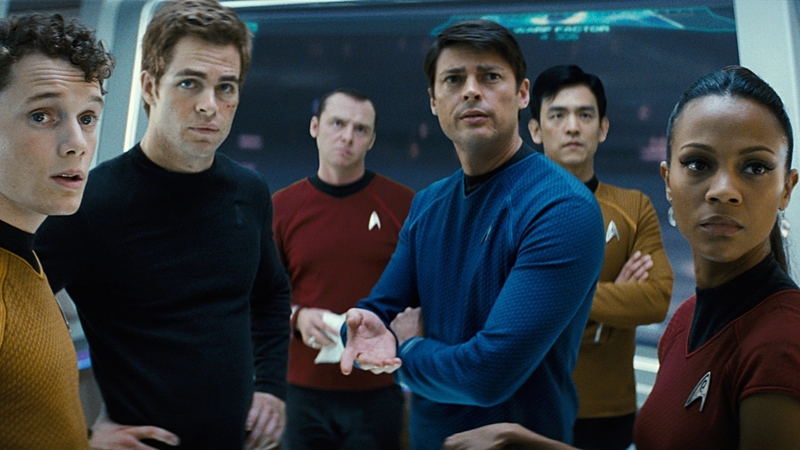 Rogers’ article is a celebration of Star Trek’s apparent breaking of the rules. However, the film really doesn’t break the rules as much it points out clearly that the present understanding of the rules is simply wrong. It all comes down to a misunderstanding over What Character Arc Really Means. It is true that the two principal characters must grow, but they don’t both have a heroic transformational change of character. The love affair with the Hero’s Journey had its time. Turning every character into a Threshold Guardian or a Mentor or a Shapeshifter does nothing to really help the evolution of storytelling as much as it does to satisfy the hubris of those who hold such axioms dear. To impose such things on a writer should be deemed tyrannical and completely counter-productive to the creative instincts of potential artists everywhere. In the 21st century, there needs to be a push towards an even greater understanding of story theory and the structures that support it. Story structure exists to carry the message, not inform it. Dramatica is an objective model designed to help an Author give meaning to her work—any meaning! If the writer wants a transformational journey of epic proportions they are more than welcome to pursue it. If instead, they want to show how a woman bent on revitalizing her childhood acting career can somehow find happiness by maintaining her own insanity (as in What Ever Happened to Baby Jane? ), then they can do that as well. The message is left entirely up to the Author’s muse. Dramatica does not think every Main Character needs to change. Dramatica does not think every story starts with a Call to Adventure, or that there is a journey into the Belly of The Whale, or that the Hero must lose himself as he becomes a Master of Two Worlds. There is absolutely no spiritual implication. Contrary to what many Hero’s Journey enthusiasts believe, the order of events has meaning. A scream followed by a slap takes on an entirely different meaning than a slap followed by a scream. Voytilla’s look into the application of the monomyth towards film analysis jumbles the order a hero takes along their journey (as described by Campbell) within many of the film examples. It is so confusing as to become useless towards an Author looking to bring greater meaning to his work. How can a system be said to meaningful if the order of the processes within is inconsequential? In sharp contrast, Dramatica’s concept of the four signposts within each throughline carry the meaning of the story’s ultimate outcome. A Tragedy will order the areas covered in each act in a completely different way than say, a Triumph would. Each story is going for a different emotional result, so the order in which things happen is vastly important. The theory is designed to prevent an Author from taking an audience down the wrong emotional path. If one accepts the idea that stories are about solving problems and that the efforts to resolve those problems ends up granting an audience some greater understanding (i.e. they mean something), then the Dramatica theory will help illuminate the processes necessary to make that story successful. If, on the other hand, one believes that stories are an examination of one man’s transcendental rebirth, then the Hero’s Journey would be more applicable. Unfortunately, not every story takes the latter approach. Not every story is a Hero’s Journey, but every story does fit within the concepts of structure outlined in the Dramatica theory of story…that is, if it has something meaningful to say.